Whether it’s because of divine inspiration or due to publicized research and technological advances, multiple designers seem to come up with parallel designs quite often. Such is the case with these two concepts: a printer that uses UV-sensitive inks and a recycling system that erases inks from papers, rendering them reusable. The two designs are so perfectly complementary that it’s difficult to believe their creators were working independently – but it just goes to show that clever minds think alike. Sharsha Lee designed the Eco Printer, a Red Dot Design Award winning design, for Liteon Technology Corp. The idea is a simple one: make non-sensitive documents easily erasable so a paper’s life cycle can be significantly extended. The printer would use photographic-type ink that is sensitive to ultraviolet irradiation. When exposed to UV light inside the printer (which doubles as an eraser), the ink would completely disappear. The paper could then be used again just like it was brand new. Obviously you wouldn’t want to print your will or a bill of sale or other important documents with this method, but in offices that insist on hard copies of documents a printer like this could save tons of money while keeping plenty of paper out of landfills. 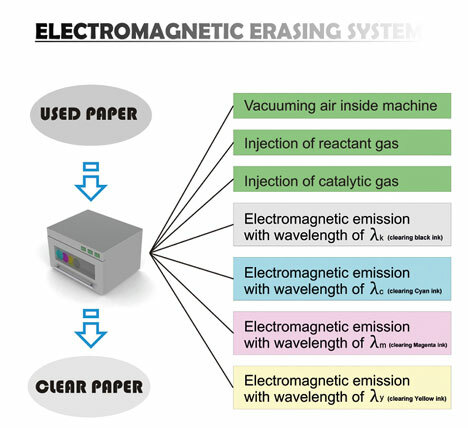 The CMYK Electro-Eraser works on the same type of idea: making ink erasable so that paper can be reused over and over. But this version uses electromagnetic radiation to break down the color pigments that make up printer and pen ink. Additionally, rather than being a proposal for a single gadget, this is a whole new system encompassing new types of printer ink cartridges, pen inks and devices to make used paper new again. However, according to designer Mohsen Saleh, the differences in printer and pen inks would be almost unnoticeable to consumers since the only change required would be to make the inks more susceptible to degradation by electromagnetic radiation. Again, this system would be inappropriate for many applications, but documents which are meant to be temporary would be a perfect match for this new type of printing/recycling/reusing system. See more in Industrial Design or under Technology. January, 2011.